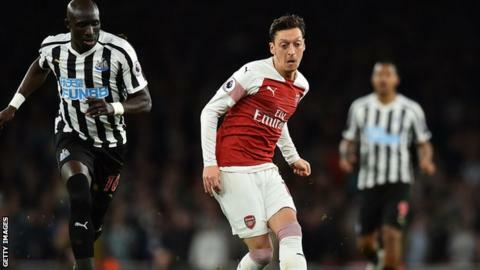 Arsenal manager Unai Emery said midfielder Mesut Ozil is "playing like we want" after producing a man-of-the-match performance against Newcastle. Ozil, at times out of favour since the Spaniard took over this season, helped the Gunners to a 2-0 win - their 10th consecutive home league victory. "I like how every player is playing and Mesut with his quality is helping us and giving us his work," he said. "Also individual moments and skills, he has the capacity to help us." Prior to Monday's win, Ozil had only started three league games since Boxing Day. In February, Emery stated that the German had to be "consistent in training and in matches, without being injured or sick". He later added that the midfielder would continue to be rotated. However, following the display against the Magpies which saw him win the official man-of-the-match award ahead of Aaron Ramsey, Emery said: "Mesut is playing like we want, with the system and tactically. He is working a lot and after that work he is also giving us his quality." Arsenal's win saw them go above north London rivals Tottenham and Manchester United to take third spot in the Premier League. Aaron Ramsey scored the opener before going off in the 67th minute with what Emery described as a "small injury". French striker Alexandre Lacazette sealed victory with a deft chip seven minutes from time. Asked if Juventus-bound Ramsey's display proved what he could have achieved if he stayed, Emery added: "Aaron is happy, he's helping us. He's playing with big performances. We need to create a big atmosphere. He knows we are in the most important moment in the season and we need every player."